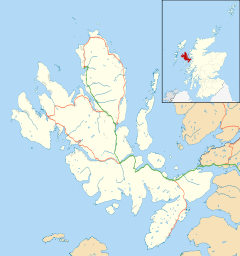 Flashader (Scottish Gaelic: Flaiseader) is a small crofting township close to the east coast of the sea loch Loch Greshornish on the island of Skye. It is in the Scottish council area of Highland. The broch, Dun Flashader, lies north of the main settlement close to the shore and beyond this is the area of Kildonan, which has a small jetty. The village of Edinbane is located south west along the A850 road. ^ Otta Swire (15 June 2006). Skye: The Island and its Legends. Birlinn. p. 90. ISBN 978-0-85790-971-8. Retrieved 19 June 2018. Wikimedia Commons has media related to Flashader. This page was last edited on 19 June 2018, at 12:14 (UTC).